Here we go again. Candidates want to reach as many voters as they can with their promises and platforms and are increasingly relying on social media to do so. However, just like the previous campaign, there are website accessibility issues. If so little thought is given to being inclusive, how will these candidates indicate their commitment to identifying, removing, and preventing barriers and comply with legislation? Accessibility is not exactly a buzz word during any election campaign, but we are all governed by the provincial accessibility legislation and its regulations, as well as the Human Rights Code. And, if senior is a buzz word during the Amherstburg election campaign, the sector is directly affected by elected officials’ decisions to strengthen a commitment to people with disabilities or not. The Centre for Independent Living in Toronto (CILT) Inc., organizer of Province-Wide Parties Debate on Accessibility and Disability Issues, invite people with disabilities and their allies from across Ontario to ask questions to each party regarding: Accessible/Subsidized/Supportive Housing, Employment, Poverty Reduction Strategies, Accessibility for Ontarians with Disabilities Act (AODA), Ontario Disability Support Program (ODSP), Education and other disability issues. May 16, 2018, from 6 to 8.30 pm Debate Livestream Webcast: https://ryecast.ryerson.ca/72/live/1807.aspx. The province aims for an accessible province by 2025, while am800 reports that Amherstburg will focus on a historical feel. Historically, the town of Amherstburg has not shown a strong commitment to ensuring equal access to persons with disabilities. There are numerous examples of perpetuated barriers, from the town’s website to the town giving taxpayer dollars to not for profit organizations with barriers. One of the most prolonged examples of a lack of commitment to barrier removal is the town of Amherstburg’s decade long resistance to making the library accessible. replace push buttons with push plates of a larger diameter that are easier to manipulate. The handrails were not installed as agreed to; in September 2005, I notified the commission that I wished to file a breach of settlement complaint against the town of Amherstburg. Within days, the handrails were replaced with ones that complied with the Ontario building code. The council of the day routinely ignored my requests for accessibility as a priority and resisted applying for grants that stipulated accessibility was a priority for funding approval. Council’s commitment to history was obvious when it donated $710,000. to the HMS Detroit, now defunct, while the taxpayers incurred rate increases as a result. Hopefully, stepping back in time will not mean taking a step backwards or having history repeat itself with the town defending itself against human rights complaints because it resists barrier removal and inclusion. All Chiefs of Police, Ontario’s municipalities, and the Municipal Law Enforcement Officers Association have been advised about the new enhanced Accessible Parking Permit (APP) and enforcement-related supports. Enforcement of accessible parking infractions in Amherstburg in the past, verified by former Police Chief Roger Hollingworth, was minimal; he confirmed that Amherstburg did not have new tickets for bylaw enforcement until January 30, 2009. In 2009, the Amherstburg Police Service issued one accessible parking infraction and one more by the spring of 2010; Hollingworth advised the town By-Law Officer may also have issued some but he did not have that information or specific information relative to the number that were contested and/or proceeded to trial and/or convictions, if any. Since the Town of Amherstburg 2015 Public Events Manual contains outdated terminology, for example, “disabled persons parking spaces and Designated Disabled Parking spaces;” it needs to be updated to reflect the fact that the Accessible Parking Permit (APP) was renamed years ago. And, although the manual mentions barrier free, there is no reference regarding what barrier free standard, if any, is to be implemented. Not one member of the current council responded to my suggestions to improve and update the town’s Public Events Manual. Last fall, the Wynne Government announced a controversial decision to hire the Deloitte firm for $415,000. to consult the public on the Government’s problem-ridden idea of a private accessibility certification process being established. The AODA Alliance reports that the Government is not having its own Accessibility Directorate conduct this consultation. 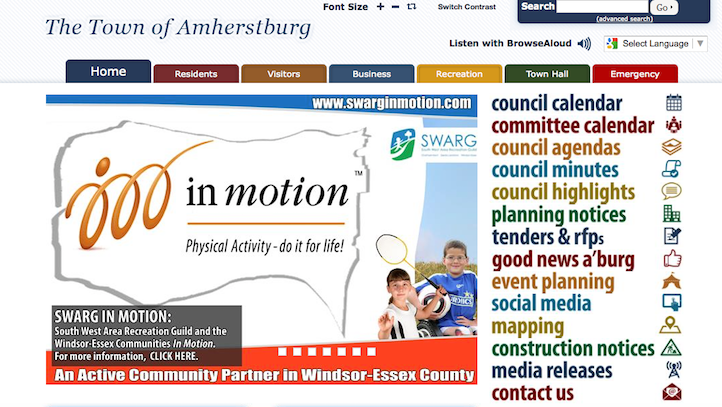 Maybe council should put the unused money budgeted for the strategic plan consultant toward hiring an expert accessible web designer to ensure, finally, that the town of Amherstburg website is accessible. The Town of Amherstburg website has been added to the new barriers in the burg page, created in conjunction with the Accessibility for Ontarians with Disabilities Act Alliance Action Kit “Picture Our Barriers” Action Kit. Despite my officially requesting an accessible website for the Town of Amherstburg since September 2002, changes are still needed today, March 4, 2016. There were promises to change but a real commitment has not materialized in all these years and for some strange reason, some people believe it will require funding. I believe the well paid IT staff should be competent enough to address all the accessibility issues. And, I wish someone would explain how a town the size of Amherstburg can afford body cameras for its police officers when larger municipalities can’t. Considering all the financial requests council considers, money doesn’t always seem to be an issue; is it a question of priorities? A new page has been added to the burg watch: barriers in the burg will contain pictures of barriers to persons with disabilities in Amherstburg in conjunction with the Accessibility for Ontarians with Disabilities Act Alliance Action Kit “Picture Our Barriers” Action Kit. For over two decades, I’ve raised awareness about the barriers in Amherstburg, at times having to resort to the human rights complaints system to ensure my equal access rights. Yet barriers continue to exclude the full and equal participation of persons with disabilities in this community; pictures will clearly depict what those barriers are. The River Town Times reports that the Town of Amherstburg has given the go-ahead for Miracle League billboards, awaiting final OK from the county and ERCA. The article includes comments from Mayor Aldo DiCarlo and Councillors Diane Pouget, Joan Courtney and Rick Fryer praising the work of the Miracle League and its volunteers, all misguided in my opinion. The Ontarians with Disabilities Act 2001 (ODA), the Accessibility for Ontarians with Disabilities Act 2005 (AODA), The Universal Declaration of Human Rights, signed by Canada, the Canadian Charter of Rights and the Ontario Human Rights Code all promote integration, not segregation. Mandatory training of Essex County Council included presentations by the Essex County Accessibility Advisory Committee that specifically addressed the full and equal participation of every member of society and attitudinal barriers that interfere with the human right to do so. Has anyone wondered why there was only one Miracle League in Canada? Has anyone wondered if negative stereotypes were being perpetuated? As an accessibility advocate, I have often criticized the Town of Amherstburg for its lack of commitment to removing barriers in the community, including attitudinal barriers. As a few examples: for the past thirteen years I have advocated for an accessible town website, for accessible voting stations, for an accessible front entrance to the town hall – would any other minority group tolerate an enter at the back sign? No progress regarding these items was made to this day. In my opinion, the approval of these billboards indicates to me that council needs to learn how to provide a more inclusive community in terms of full and equal access to recreation, festivals, communications, facilities and more. Kathie Snow, of Disability is Natural, and a previous keynote speaker at the Essex County Accessibility Advisory Committee Accessibility Workshop has published several informative articles on her site, including Separate And Unequal, about segregated sports, which I highly recommend. All the information is readily available in legislation and resources; those should be guiding council’s actions, not emotions and misguided intentions. In a letter to the editor, River Town Times, April 8, I expressed my concerns regarding town council’s pre-approval of grants to four community organizations: the Park House Museum, North American Black Historical Museum, Amherstburg Community Services and the House of Shalom Youth Centre. It would appear, in a letter the RTT published this week from Kathy DiBartolomeo, Amherstburg Community Services, that my concerns were misunderstood. To reiterate, council is using taxpayer dollars to grant these requests, despite a well-publicized 46 million dollar debt and promises of fiscal responsibility to control and/or reduce it. I disagree. Council has not found money over the past twelve years to ensure the town’s website and its documents are universally accessible, but community organizations have received approximately $360,000.00 in grant funding in that time frame. Policy F10-Grants to Community Groups, enacted May 25, 2005 and amended September 22, 2008 is another outdated municipal policy that needs to be updated. Council should include accessibility criteria as a requirement when evaluating grant requests from organizations. Additionally, council needs to enact a municipal policy that no public funds will ever be used to create or perpetuate barriers against persons with disabilities. Because of a lack of an accessibility requirement, shamefully, council has committed taxpayers’ dollars to four organizations that maintain websites with accessibility issues. Firstly, it’s the taxpayers that are funding these groups, thanks to council’s decision, which I disagree with. I’d rather personally decide what, if any, organizations receive my donations. Accordingly, the organizations could extend their fundraising activities to seek more donations from those supporting individuals and/or corporations instead of requesting taxpayer funding. Secondly, given Amherstburg’s much publicized debt crisis, council knew it would be faced with tough decisions during last fall’s municipal election campaign when we heard numerous promises of fiscal responsibility. Councillor Leo Meloche was also in favour of keeping the groups funded, suggesting that town vehicles that need replacing be stretched out for another year. Has accessibility also taken a back seat yet again? Council has not found money over the past twelve years to ensure the town’s website and its documents are universally accessible, nor has it demonstrated a strong commitment to a more inclusive community. Council concluded these agencies and organizations are of value to the community, but council should include accessibility criteria in its evaluation of monetary requests. I still strongly believe a policy is needed so council can consider the impact of its decisions on everyone, including persons with disabilities. The town’s Hiring of Employees policy, one of the policies former CAO Phipps would not provide without “a reasonable explanation for the request,” can now be found on the town’s website and CAO Miceli did provide it. An updated policy is needed to reflect the passage of the 2005 AODA, the IASR (Integrated Accessibility Standards Regulation) and the town’s 2013 IASR Policy to include the requirement to notify its employees and the public about the availability of accommodation for applicants with disabilities in its recruitment processes. 1762668 Ontario Inc., owned by Rennie and Anne Rota, was added to the Accessibility Hall Of Shame because it failed to comply with a February 20, 2014 Human Rights Tribunal Ontario Order, part of which stipulated, “The landlord must retain a consultant with expertise in human rights, disability and access who will provide training to Mr. Rota, and any managers, on the landlord’s obligations under the Code with respect to accommodating disability, and the landlord must provide to the applicant by June 1, 2014, a copy of a letter from the consultant verifying that the training is completed. Six and a half months late, a December 20, 2014 letter certified that Rennie Rota completed a Human Rights Training Program; the letter was received via regular mail December 30, 2014. Now, seven and a half months late, Anne Rota completed a Human rights Training Program.